IA Design were appointed to create a dynamic, collaborative workspace that reflected the professional and high performance culture of 2H Offshore Engineering. 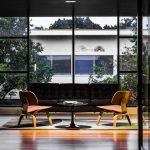 A core focus of the design brief was to create a workplace that reflected the 2H brand and company culture from the reception area through to the back of house. 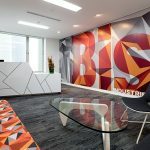 The reception area features bold designs that emulate the people-centric nature of 2H, and these designs carry through to the work stations to create an engaging and exciting experience for all. As time was a critical driver for this project, the IA Design team quickly established communication protocols which aided the streamlined delivery of the project. The success was driven by ongoing communication with all stakeholders, resulting in cost savings, timely project delivery and an extraordinary new work environment.